What are Center Turn Lane Violations? When you are driving in the state of New York, there are specific lanes designated for specific purposes. For example, there may be a left and right turn lane to allow motorists to head in different directions instead of proceeding straight down the same path. When lanes are designated for specific purposes, every motorist is expected to comply with the rules and use only the lane appropriate to their desired driving maneuver. Sometimes, however, drivers will break the rules and commit a center turn lane violation or another similar violation in which a motorist either turns or goes straight from an incorrect lane. A motorist can be ticketed for a turn lane violation and could face serious penalties including points on a driver’s license and fines. The financial consequences could be substantial if you are ticketed for a turn lane violation, as this is a moving violation that could trigger an increase in insurance premiums if the insurer believes you are now a higher-risk driver. The good news is, you don’t just have to accept that an accusation you committed a violation will result in your being adjudicated guilty. If you are accused of a center turn lane violation, you can fight the claims made against you and potentially protect your driving record. NY Traffic Firm is here to help. We can assist you in determining if the state has sufficient proof to demonstrate you committed a turn lane violation and, if so, we can help you to avoid plea bargain options that would reduce possible consequences of the moving violation. We can also provide help if you want to fight the ticket and make the state prove beyond a reasonable doubt that you broke the rules on center turn lanes. You should give us a call as soon as you have been accused of breaking any rules of the road to learn how our legal team can help to fight for you so your finances and driver’s license aren’t put at risk by being found guilty of a traffic offense. New York Vehicle and Traffic Law section 1160(a) mandates that right turns be made from the right turn lane. Sections 1160(b) and 1160(c) govern lefthand turns, and the rules for these turns vary depending upon whether you are turning from a two-way or a one-way road. Motorists could also be cited under New York Vehicle and Traffic Law section 1163(a), which prohibits general improper turns. It’s important to know the rules for both right and left turns, as well as general rules for turning in traffic, because when there are designated turn lanes for left and right turns, turning from the center lane could be considered improper and a violation of New York’s traffic laws. This moving violation could lead to a fine and two points on your driver’s license. 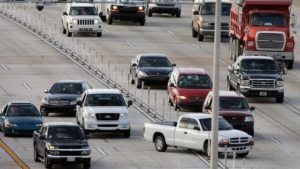 If you get too many points, you could end up with a suspended license — but even a single record of a moving violation could cause your insurance rates to rise and could make it impossible for you to get a job for which a clean driving record is a prerequisite. These consequences cannot be avoided once you have admitted guilt, so be smart about responding to a ticket if you’ve been accused of a center turn lane violation. A New York City traffic ticket lawyer can provide you with representation if you have been accused of a center turn lane violation. Our goal is to help you avoid fines, protect your license by avoiding points, and keep your auto insurance costs low by keeping your driving record clean. You should contact NY Traffic Firm as soon as you have been accused of a turning lane violation so we can begin putting together the right legal strategy for you. Call today to get your case started.